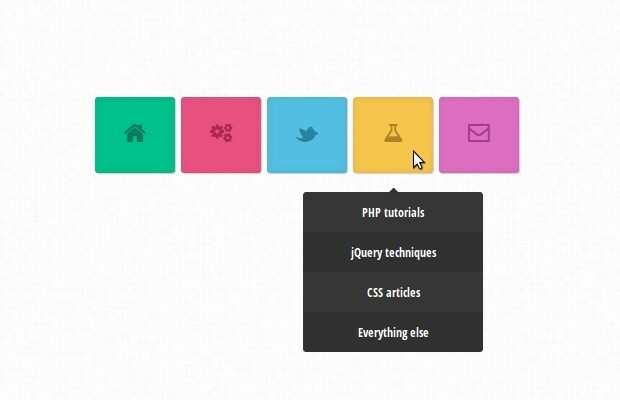 In this short tutorial, we will be creating a colorful dropdown menu using only CSS3 and the Font Awesome icon font. An icon font is, as the name implies, a font which maps characters to icons instead of letters. This means that you get pretty vector icons in every browser which supports HTML5 custom fonts (which is practically all of them). To add icons to elements, you only need to assign a class name and the icon will be added with a :before element by the font awesome stylesheet. Each item of the main menu is a child of the topmost unordered list. Inside it is a link with an icon class (see a complete list of the icon classes here), and another unordered list, which will be displayed as a drop down on hover. We are setting a inline-block display value so that the list items are shown in one line, and we are assigning a relative position so that we can offset the dropdowns correctly. The anchor elements contain the actual icons as defined by Font Awesome. The 200px value is arbitrary and you will have to increase it if your drop down list contains a lot of values which do not fit. Unfortunately there is no css-only way to detect the height, so we have to hard code it. One neat aspect of using icon fonts, is that you can change the color of the icon by simply declaring a color property. This means that all customizations you might want to make can be done with CSS alone. Icon fonts are a great addition to one's web development toolset. As they are regular fonts, you can use the font-size, color and text-shadow properties to customize them. This example doesn't use images nor JS, so it should be fairly easy to match it with your current design and use it within a few minutes. I'm having some strange effect after mouse hover (contact box) using Safari. This looks like a rendering bug. Can somebody else confirm it? I see the same rendering bug in Safari, something I have also experienced on my own website with CSS3 transitions for changing background colour on hover. It is indeed a rendering bug. It will probably be fixed in the next release of Safari, but until then I am afraid we will have to put up with it. Yes,I agree with you Martin , there is a rendering bug, the hide or fadeOut shoudl be faster than show or fadeIn. I like the way you explain your tutorials. You make it easy to understand the technique without complicating it.. This should make it work. Remember to also increase the width of the UL so the menu items fit on one line. Thanks, great tutorial. So simple. Love it! Total awesomeness. Very clean design. When, I completed the code, I ended up with the navigation stacked not side by side. I'm an idiot. Never mind. Pure front-end delight plus totally usable too. Great job Martin! Simple and Smart... great Tutorial. Thank you very much for this useful tuto but I have a problem with those icons. I think that some browsers prevent you from including fonts from your local hard drive. Test the menu through xampp (or other apache+php package). Hi Martin, nice to see this article.. I need a few help here.. I want to remove the rounded-rectangle behind the menu, which line of code in css should I modify? If I want to create a website having 10 pages with the same layout how do I go about that? And to create such menu's should I just keep on learning from tutorials(like yours) or first learn a lot about css and then try to learn via tutorials? My knowledge so far:- basic webpages (2 coloumns with a sidebar ,etc). Hi, Very nice work Martin, thanks. Just wondering how to make this more accessible? I'm thinking of using a combination of text and/or icons to create my top level menu. Some links will only be the icon and I'm wondering how to cope with screen readers using your method. Any ideas? Nice man, how did you add the birds effect? Though this is after a long time, this link may help somebody somewhere. Really great article, I was just wondering how you would go about making the list items appear above rather than below...? not working for internet explorer. Thanks for the CSS drop down menu, it's looking great. Thanks, very inspirational. Might use this on my future projects. Thanks for this. I've been struggling with creating an animated drop down menu at work all week but your tutorial made it simple to understand the concepts behind what you are doing. Thanks! This tutorial is exactly what I was looking for. I'm in the process of building my company website by myself (i'm a designer but no background in programming). I've got some headlines on my webpage, that I'm hoping to mouse over and reveal a section with related details. Question: I've drawn the icon for the mouseover using HTML5 Canvas element. Is it possible to use this instead of the custom font (I like the pixel perfect rendition)? The example is not working in Internet explorer properly. if u click on demo and open it in IE it does not open as it opens in Chrome and mozilla. Can anybody let me know the how to open it in IE properly? Thank u so much for this menu... Its Really nice and simple. First of all, I would like to say thanks for sharing this great post and valuable tips. This is really helpful to me and I am thinking that why not to use these tips on my blog also.